In the 2012 edition of Occupy Money released last week, Professor Margrit Kennedy writes that a stunning 35% to 40% of everything we buy goes to interest. This interest goes to bankers, financiers, and bondholders, who take a 35% to 40% cut of our GDP. That helps explain how wealth is systematically transferred from Main Street to Wall Street. The rich get progressively richer at the expense of the poor, not just because of “Wall Street greed” but because of the inexorable mathematics of our private banking system. This hidden tribute to the banks will come as a surprise to most people, who think that if they pay their credit card bills on time and don’t take out loans, they aren’t paying interest. This, says Dr. Kennedy, is not true. Tradesmen, suppliers, wholesalers and retailers all along the chain of production rely on credit to pay their bills. They must pay for labor and materials before they have a product to sell and before the end buyer pays for the product 90 days later. Each supplier in the chain adds interest to its production costs, which are passed on to the ultimate consumer. Dr. Kennedy cites interest charges ranging from 12% for garbage collection, to 38% for drinking water to, 77% for rent in public housing in her native Germany. Her figures are drawn from the research of economist Helmut Creutz, writing in German and interpreting Bundesbank publications. They apply to the expenditures of German households for everyday goods and services in 2006; but similar figures are seen in financial sector profits in the United States, where they composed a whopping 40% of U.S. business profits in 2006. That was five times the 7% made by the banking sector in 1980. 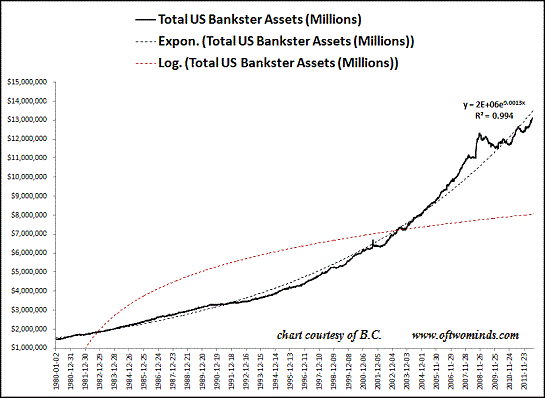 Bank assets, financial profits, interest, and debt have all been growing exponentially. Exponential growth in financial sector profits has occurred at the expense of the non-financial sectors, where incomes have at best grown linearly. By 2010, 1% of the population owned 42% of financial wealth, while 80% of the population owned only 5% percent of financial wealth. 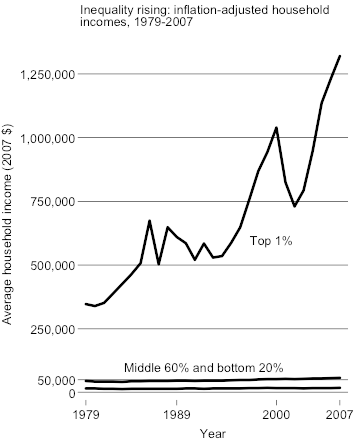 Dr. Kennedy observes that the bottom 80% pay the hidden interest charges that the top 10% collect, making interest a strongly regressive tax that the poor pay to the rich. Exponential growth is unsustainable. In nature, sustainable growth progresses in a logarithmic curve that grows increasingly more slowly until it levels off (the red line in the first chart above). Exponential growth does the reverse: it begins slowly and increases over time, until the curve shoots up vertically (the chart below). Exponential growth is seen in parasites, cancers . . . and compound interest. When the parasite runs out of its food source, the growth curve suddenly collapses. Even if you pay within the grace period, you are paying 2% to 3% for the use of the card, since merchants pass their merchant fees on to the consumer. Debit cards, which are the equivalent of writing checks, also involve fees. Visa-MasterCard and the banks at both ends of these interchange transactions charge an average fee of 44 cents per transaction—though the cost to them is about four cents. The implications of all this are stunning. If we had a financial system that returned the interest collected from the public directly to the public, 35% could be lopped off the price of everything we buy. That means we could buy three items for the current price of two, and that our paychecks could go 50% farther than they go today. Direct reimbursement to the people is a hard system to work out, but there is a way we could collectively recover the interest paid to banks. We could do it by turning the banks into public utilities and their profits into public assets. Profits would return to the public, either reducing taxes or increasing the availability of public services and infrastructure. By borrowing from their own publicly-owned banks, governments could eliminate their interest burden altogether. This has been demonstrated elsewhere with stellar results, including in Canada, Australia, and Argentina among other countries. In 2011, the U.S. federal government paid $454 billion in interest on the federal debt—nearly one-third the total $1,100 billion paid in personal income taxes that year. If the government had been borrowing directly from the Federal Reserve—which has the power to create credit on its books and now rebates its profits directly to the government—personal income taxes could have been cut by a third. Borrowing from its own central bank interest-free might even allow a government to eliminate its national debt altogether. In Money and Sustainability: The Missing Link (at page 126), Bernard Lietaer and Christian Asperger, et al., cite the example of France. 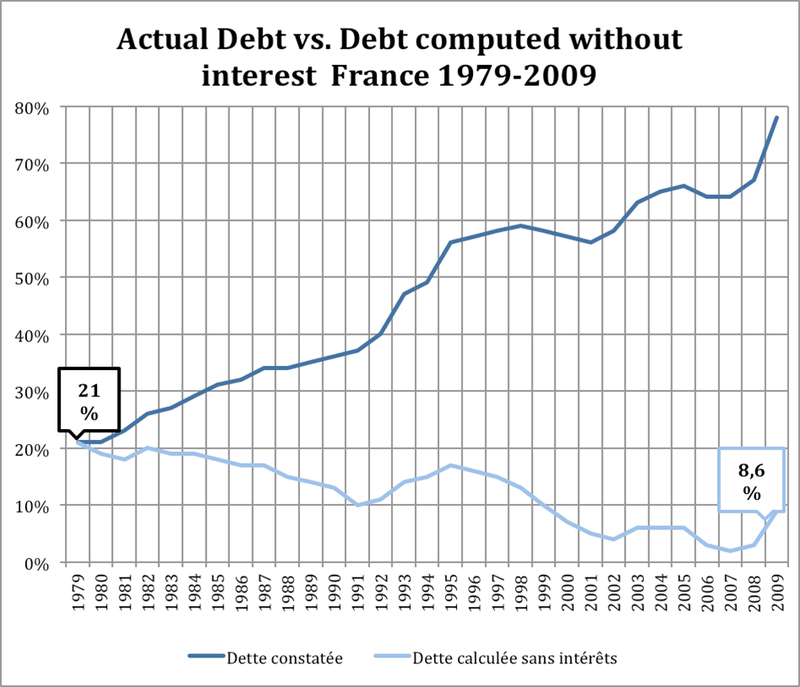 The Treasury borrowed interest-free from the nationalized Banque de France from 1946 to 1973. The law then changed to forbid this practice, requiring the Treasury to borrow instead from the private sector. 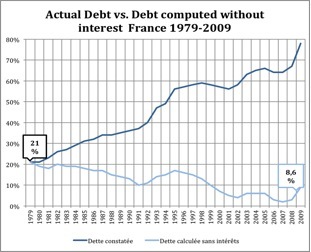 The authors include a chart showing what would have happened if the French government had continued to borrow interest-free versus what did happen. Rather than dropping from 21% to 8.6% of GDP, the debt shot up from 21% to 78% of GDP. It is not just federal governments that could eliminate their interest charges in this way. State and local governments could do it too. Consider California. At the end of 2010, it had general obligation and revenue bond debt of $158 billion. Of this, $70 billion, or 44%, was owed for interest. If the state had incurred that debt to its own bank—which then returned the profits to the state—California could be $70 billion richer today. Instead of slashing services, selling off public assets, and laying off employees, it could be adding services and repairing its decaying infrastructure. The only U.S. state to own its own depository bank today is North Dakota. North Dakota is also the only state to have escaped the 2008 banking crisis, sporting a sizable budget surplus every year since then. It has the lowest unemployment rate in the country, the lowest foreclosure rate, and the lowest default rate on credit card debt. Globally, 40% of banks are publicly owned, and they are concentrated in countries that also escaped the 2008 banking crisis. These are the BRIC countries—Brazil, Russia, India, and China—which are home to 40% of the global population. The BRICs grew economically by 92% in the last decade, while Western economies were floundering. One of many cities crushed by this Wall Street “insurance” scheme is Philadelphia, which has lost $500 million on interest swaps alone. (How the swaps work and their link to the LIBOR scandal was explained in an earlier article here.) Last week, the Philadelphia City Council held hearings on what to do about these lost revenues. In an October 30th article titled “Can Public Banks End Wall Street Hegemony?”, Willie Osterweil discussed a solution presented at the hearings in a fiery speech by Mike Krauss, a director of the Public Banking Institute. Krauss’ solution was to do as Iceland did: just walk away. He proposed “a strategic default until the bank negotiates at better terms.” Osterweil called it “radical,” since the city would lose it favorable credit rating and might have trouble borrowing. But Krauss had a solution to that problem: the city could form its own bank and use it to generate credit for the city from public revenues, just as Wall Street banks generate credit from those revenues now. Public banking may be a radical solution, but it is also an obvious one. This is not rocket science. By developing a public banking system, governments can keep the interest and reinvest it locally. According to Kennedy and Creutz, that means public savings of 35% to 40%. Costs can be reduced across the board; taxes can be cut or services can be increased; and market stability can be created for governments, borrowers and consumers. Banking and credit can become public utilities, feeding the economy rather than feeding off it.